I can't believe so much time has past since my last blog entry. I wanted to get something down, especially this race report from just a little over a week ago down before I forget everything. It was fun and challenging. All in all a good time. Finish time just under 8:35, which amazed me since I had to slow down quite a bit. It's funny how paces under different conditions mean different things. I remember looking at my watch and seeing the pace at 12:45 and thinking "Awesome!! I'm under 13:00" Other times I didn't even look for miles and miles. The hills and the heat made it a humbling experience - in no way humiliating, but very humbling. 50 miles is a long way to go. Started out in the dark, running behind two or three other people including a woman named Heather who was also wearing Brooks Launch like I was (made me feel better that I'm not the only dork who doesn't wear trail shoes on a trail run!). I think the first 5 miles was the most enjoyable, somewhere around a 10:00 pace. After the warm up loop, passed through the start and saw Jenny, Sean, and MPR. Start of the first big loop went well. Ran on sections of trail I had never been on including a long narrow gulley which I had to walk most of. I caught back up to the people I ran with for the first 5 miles, then came up behind Andy Barrett. Andy has done a ton of races and I thought to myself I should not pass Andy since he knows what he's doing and I don't. We chatted a bit and he would look at his watch and say he was going too fast. Finally I asked if I was messing up his pace, he said yeah, he was going a little faster than planned since I was behind him. So, I got in front of him and put some space between us. The rest of the first loop felt great with a few miles under 9:00 pace. Shortly after the start of the second loop I started to think I was in trouble. I had been running by feel and enjoying the day, but I wasn't pacing myself. I was taking no walk breaks. 50 miles is not 62 miles, but it is also not 26 or 31 miles. I made an effort to purposely slow down a bit. At 23.4 miles I went down pretty hard. Landed on my right side with the force spread between my hip and shoulder. There's the moment when you're not sure if you are hurt or not, fortunately I wasn't, got up, brushed myself off and got going again, a little more mindful. I reached the aid station where Dawn S. was volunteering, stopped for a bit, then Andy B came up from the trail and went by me. I started running behind him again, felt good but kept a good gap and eventually let him go again. and the last aid station. The hills had grown a little taller but were still not that bad (glad I at least was able to come out a few weeks earlier and run these hills two sets of out and back). Coming back up Tucker hill, I saw Eudair running toward me. We ran back to the starting area where Franco took my picture and they helped me switch out my bottles. I put some ice in my pockets and kept going. Andy B. was there again and I stayed behind him again for a bit before letting him go once again. 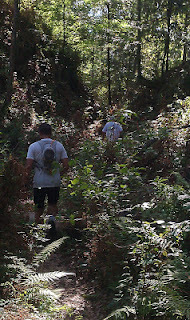 The mental boost of seeing Eudair, starting the third loop and catching back up to Andy soon started to fade. Walking again became my friend. I had listened to some music but soon was not in the mood to listen to it. Instead, the most comforting sound was when I was walking, there was a breeze and I could hear it whooshing through the trees overhead. I'd walk a bit and then say to myself, ok, just an easy jog for a bit. No set run walk schedule, just walk for a bit and then try to make it to the next up hill or maybe the next mile or half mile point on the garmin. 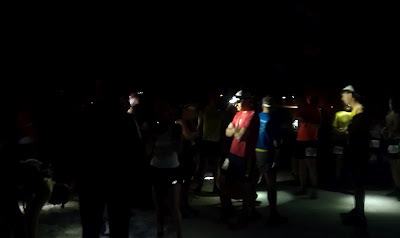 Saw Dawn at her aid station for the last time then made my way out to the pit again. Would stop and chat here and there with people walking the 50K. I was thirsty, but my stomach was full of fluid, almost but not quite sloshing, I was sweating and would stop here and there for a bathroom break, so although very thirsty I was not yet dehydrated. 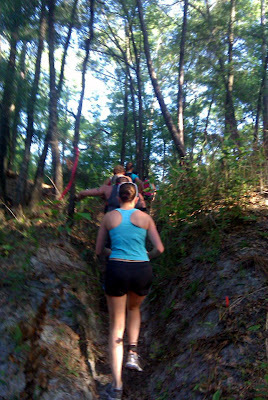 Reaching the last aid station was a huge boost. The volunteers were super encouraging, told me my place and said "Just 5 more miles!" Yes, I can do that I thought. For the third trip through the hills, they had grown a little taller still and I think they added one or two more onto the course. I looked at my watch and saw 8:18. I didn't think it was possible but it looked like I could still beat my 50 mile time from Iron Horse. So, I did the best I could to keep going. Came up to a couple who was walking the 50K, they told me "one mile out". Another big boost. I looked for the white stripes on the trees that marked the designated camping areas because that was a sign of being almost done. Up the last section of hill and finally DONE!! Got my finishers mug and filled it with ice and mountain dew twice. Saw Andy B. who it turns out I was one minute behind. And then I sat for about 45 minutes. Actually, I'd stand for a bit and then sit down, but basically did nothing. I was hurting and drained, but felt really good deep down inside. A lot can happen in 50 miles. I wanted to see what I was capable of today, so I went out a little bit faster (after taking it easy during the dark part), and although I had run the hilly section a few times a couple weeks earlier, and I had run a good part of this course already and felt ready, the course and the heat got to me a little bit. I'm itching to do another 50 or more mile race soon, just not sure which one yet. I took Sunday and Monday off, but decided to go for a run on Tuesday morning, it went better than expected, doing just over 5 miles at about an 8:30 pace. I was surprised how good I felt. Now I'm racking my brain to figure out what I did that made me recover quickly so I'll be able to do this again - here's what I remember - 2 cups of mountain dew over ice in my croom finisher's mug, one shocktop, a few random snacks followed by a bud lite lime given to me (free beer somehow tastes better! ), a muscle milk on the drive home, tijuana flats for dinner, a mostly relaxing Easter Sunday, a short walk on Monday - well, in any event I am thankful for feeling good. I'm pretty sure it was Tijuana Flats ;-) ! Great job! Does it ever get boring running all those miles? Hasn't gotten boring yet, too much going on with trying not to trip, enjoying the scenery, and chatting to people, although I hear there are some courses which can get boring.